We wanted to make a difference and we thought it was a great way for the co-ops to work together and contribute to our communities. After all, everyone is affected in one way or another by cancer, so it was an easy effort to get behind. In 2009, three Ohio-based cooperatives founded “Fueling the Cure.” The goal was to work “cooperatively” in order to raise $50,000 for breast cancer research. The cooperatives, United Landmark, Southwest Landmark and Heritage Cooperative, each pledged to donate $1 per delivery stop of bulk propane. As the years passed, the program grew. And grew! Today, “Fueling the Cure” is a collaboration between four Ohio and one Indiana-based cooperatives, and as of December 20th, 2017 the program has raised more than one million dollars. Dixon, however, never anticipated the overwhelming response “Fueling the Cure” would receive. 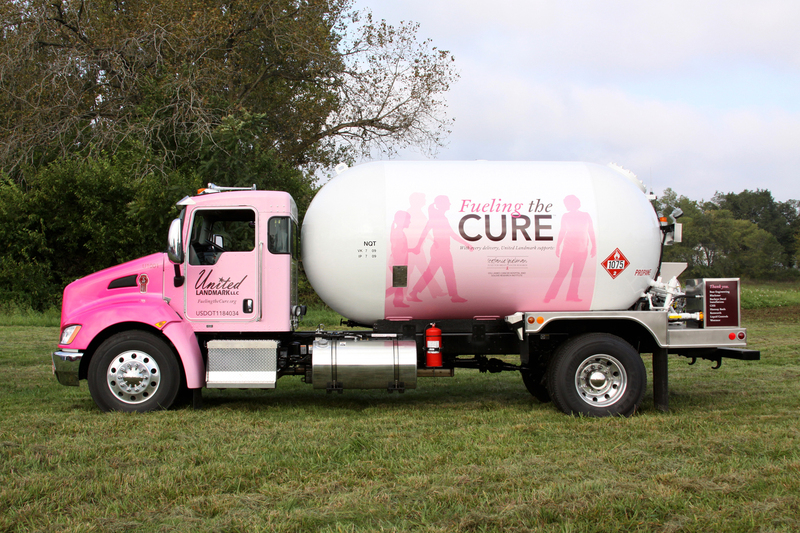 In conjunction with the launch, the co-ops wrapped a number of their large, propane tankers with bold, pink messaging promoting “Fueling the Cure.” The trucks helped the initiative quickly gain awareness and momentum. Feedback from both co-op employees and their customers was extremely enthusiastic. Everyone wanted to be involved. As 2017 drew to a close, the five co-ops now involved – United Landmark, Heritage Cooperative, Sunrise Cooperative, Centerra Cooperative and Premier –Ag – were pleased to announce that, together, they had raised more than one million dollars. 100% of the money goes directly into “Cooperatives for the Cure of Cancer,” an endowment fund the organizations established in 2011 at The Ohio State University Wexner Medical Center. Dr. Steven Clinton oversees the fund. “The Ohio State University was established as a Land-Grant Institution almost 150 years ago. Throughout the decades OSU research has contributed substantially to the productivity and success of agriculture. More recently food and agricultural scientists are collaborating closely with The James Cancer Hospital to provide novel new foods and dietary strategies to promote cancer prevention and enhance the efficacy of therapy and survivorship. The Fueling the Cure effort continues to support the research that will be critical to elimination of cancer as a major health burden for future generations, ” Clinton said. The co-ops and their customers are united in their desire to see “Fueling the Cure” continue. And while at times the co-ops compete with each other for business, they plan to continue working cooperatively together to keep raising money. “Every dollar that we raise goes directly to cancer research. In addition, this has united our employees, the co-ops themselves and our customers. That’s a win-win-win, and we don’t plan to stop,” said Leindecker. For more information and to donate please visit http://www.fuelingthecure.org.